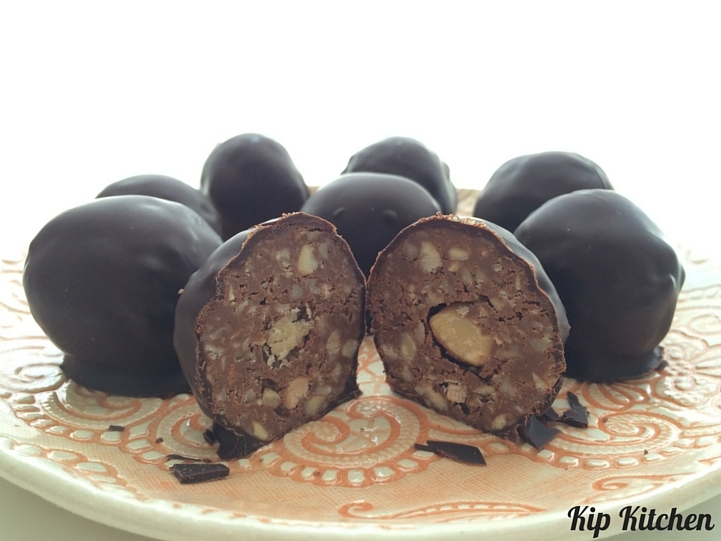 When I first made this homemade Ferrero rocher recipe, it was just for fun. Then I posted some pictures of this treat on social media, and some of you guys asked me if you could find the recipe on my website. 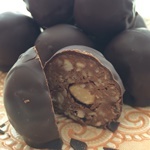 Of course I’m willing to share with you how to make Ferrero rocher chocolates at home. And they are so good that I’d be curious to know how many more friends you have after making them. I prefer to be honest, so let me warn you about one thing. You will make a delicious Nutella mix. It will stick to your fingers until you have no choice but to lick them when you are done. This is the privilege of the cook. You will also melt some chocolate in the process. Don’t let anyone enter the kitchen and you will get to lick the spoon too. And if you are a chocolate addict like me, you will be happy to make these evil Ferrero rocher chocolates again. Add chopped hazelnuts, crushed wafer cookies and Nutella in a mixing bowl. Mix well: you will get a big sticky ball of Nutella mix. Place it in the fridge for 1 hour. Get your baking sheet. Make sure you use one that is small enough to be placed in your fridge. Cover it with parchment paper. You will now use the hazelnuts that you kept aside. Take one hazelnut and a teaspoon of the Nutella mix from Step 1. With your hands, form a ball the size of a walnut, with the hazelnut in the center. Congrats, you’ve just made your first ferrero rocher! Place it on the baking sheet. When you have made around 15 ferrero rocher balls, refrigerate them again for at least 30 minutes. Now, melt the chocolate in a double boiler. Pour it into a bowl. Then, get the Ferrero rocher balls from Step 2 from the fridge. Dip them one by one in the melted chocolate until they are fully coated. Next, line the Ferrero rocher balls up on the baking sheet you previously used. They should not touch each other, otherwise they will stick together. Place the baking sheet in the fridge for another 30 minutes and you are ready to serve. 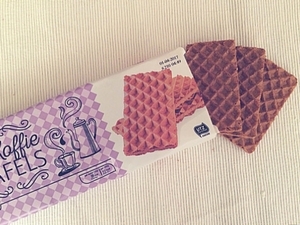 Hi Jean, I added a picture of wafer cookies to the post. At least the ones I find here in the Netherlands. They are crunchy biscuits that usually look like waffles. Try to find some that you can easily crush into a powder. Good luck with the recipe!